One of the best ways of heating or cooling your home is by adding spray foam insulation to the structure of your house. This is the perfect way to get the desired temperature that you want and taking care of the house in an eco-friendly way. It is also something that does not require strenuous maintenance, unlike heaters and air conditioners that demand constant attention. It is an ideal solution for your home to make sure that your family is always comfortable all the time. The reason why it is important to have a steady temperature in your home, is because your heating and cooling systems will automatically work overtime if it is too hot or too cold. This means that your energy consumption will increase which in turn means that the power bill will increase. It could have severe effects on your savings and your budget at the end of every month. It is thus clear that by making this investment you will be saving in the long run by ensuring that you have a constantly perfect temperature inside of your house or office area. 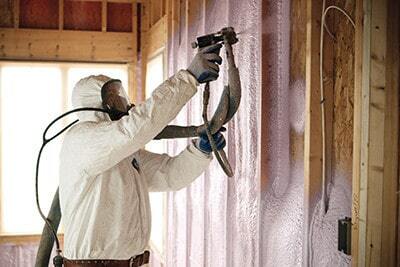 There are different types of insulation and not all homes will need the same type or quantity. We will be more than happy to inspect the property and to assist you in making the decision. We will be able to tell you whether you need insulation for finished or unfinished walls, for walls and ceilings, an insulation based on your preference like cellulose, plastic, or natural, and the type of method you would prefer: a blow-in spray foam installation process or material that will fit in between studs, beams, or joints. No matter the reason, we will assist you with a smile on our face. We have been in the spray foam insulation industry for many years and we have massive amounts of experience when it comes to treating homes optimally. You will not be able to find a more trusted source anywhere else. We still believe in old traditional values, hard work, and absolute honesty with our client base. We have received positive feedback on the jobs we have done and promise to continue to do so for many more years to come. Whatever your needs are, we will be able to sort them out. We use spray foam insulation of a very high quality which means that you are basically making an investment in your house. We have a team of professionals who are fully trained to ensure that purchase, inspection, and insulation are done correctly according to the standard procedure. With us, you are number one and we keep in mind that your house should deliver optimum, desirable temperatures. There is absolutely no fuss involved in creating these circumstances; all you have to do is make an appointment and we’ll deal with the rest.